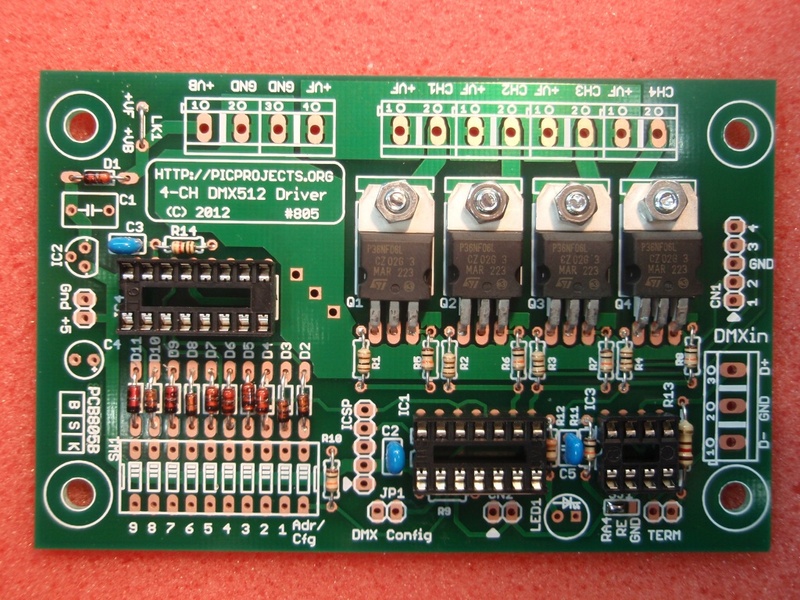 The original DMX512 driver project #800 is now redesigned to incorporate the optional address configuration switch on the main PCB. 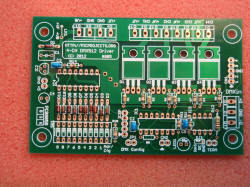 Double sided PCB has resulted in a more compact board size. Firmware has been updated to run a latest generation enhanced midrange PIC16F1823 processor. Outputs can drive LED modules, strips, lights or low voltage lamps up to 35 watts. 8 bit resolution PWM mode with a PWM period of 5ms (200Hz). When no DMX data is received the driver can be configured to turn off all outputs, or leave them in their current state. Configuration held in EEPROM so once configured can operate with no external switches or jumpers. 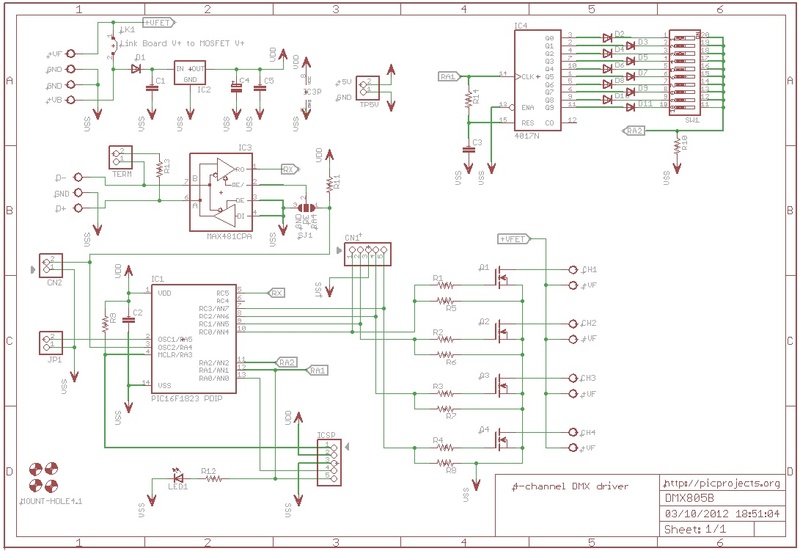 In keeping with the original 4-channel DMX driver project #800, the firmware supports a minimal external hardware design. Although the new PCB805B has a configuration DIP switch on the board, the DMX base address and configuration modes are stored in the microcontrollers internal non-volatile EEPROM. Once settings have been made the firmware uses the saved settings from the EEPROM if no DIP switch is detected. Additionally the original configuration via in-band DMX channel data is still supported. Fitting a single jumper puts the firmware into 'in-band' configuration mode. 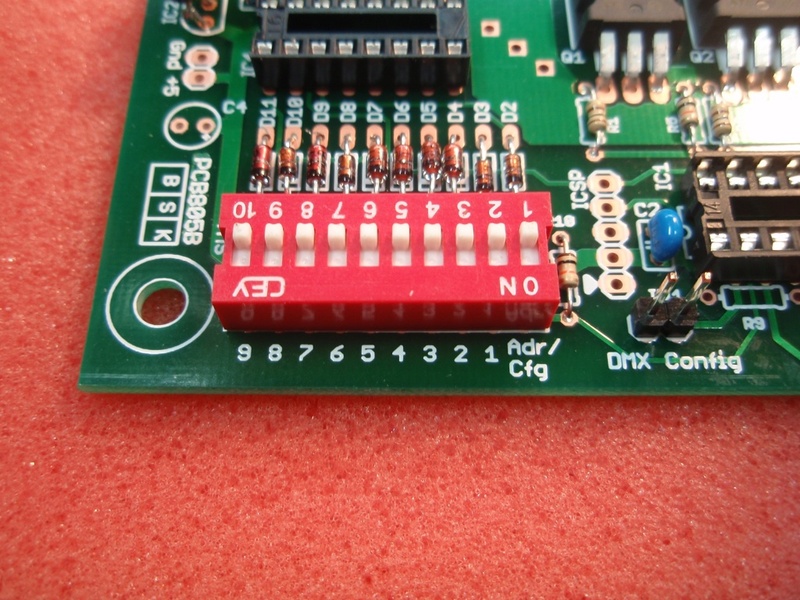 DMX data sent in the first four channels is saved to the EEPROM allowing the DMX base address and configuration word to be setup without the use of the external DIP switch. 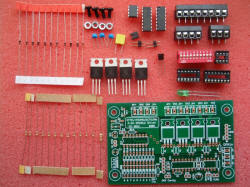 Buy a complete kit of parts from the PICPROJECTS online eShop. 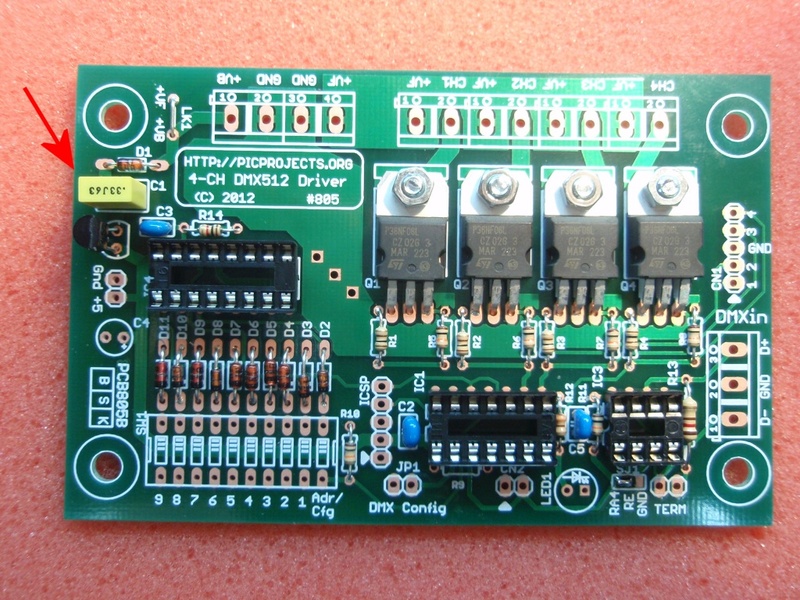 Kit contains all the components required to assemble the complete 4-Channel DMX512 Driver project, including the PCB and microcontroller pre-programmed with the DMX805 firmware. All resistors are 5% carbon film. 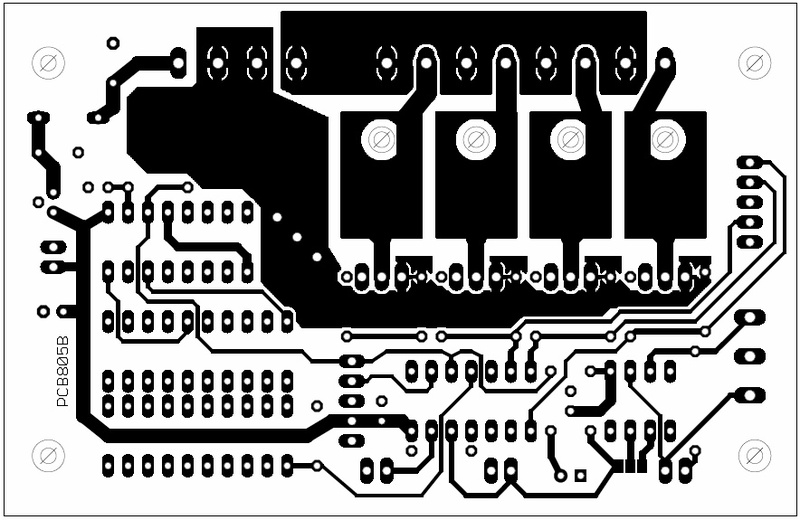 Where 0.125 (1/8) watt parts are specified these are required to fit on the PCB due to size constraints. Apart from resistor R13 all other resistors are 0.125 (1/8) watt parts. 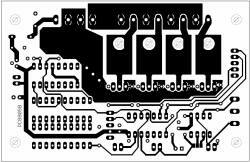 These a specified for physical space constraint reasons on the PCB. 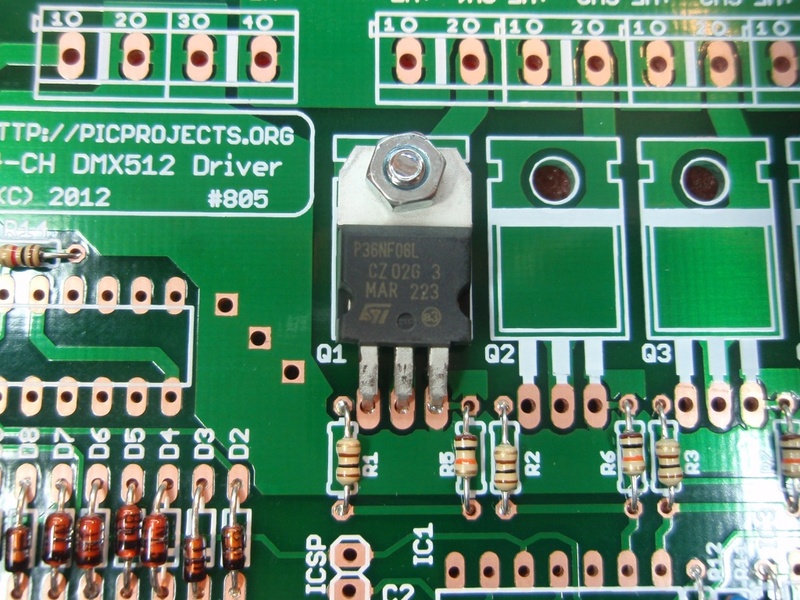 Alternative pin-compatible parts exist for the RS-485 transceiver, IC3. Assembly is straightforward. 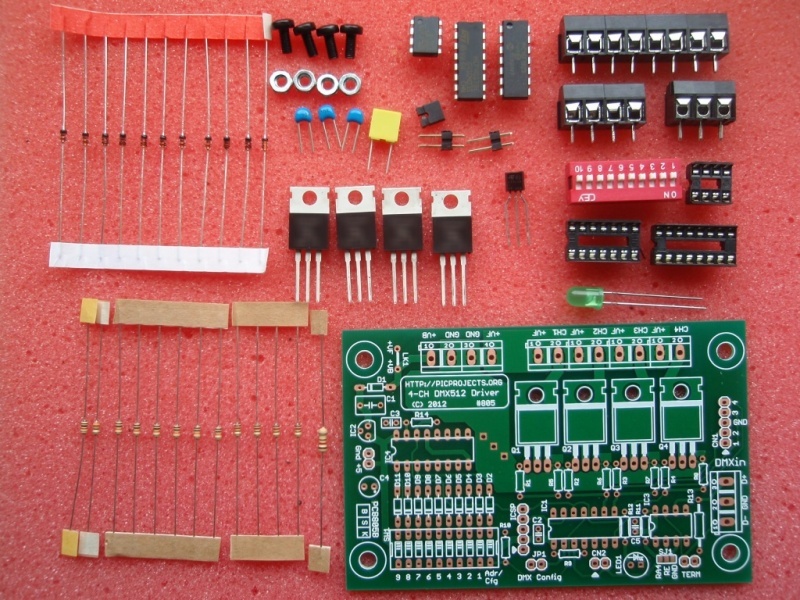 You will need previous experience soldering electronic components, a suitable soldering iron, hand tools and a multi-meter. All photographs in the section link to a hi-res 1024x768 image for more detail. The MOSFETs are packed in a separate anti-static bag - don't remove them until needed. IC's 1,3 & 4 are shipped on black anti-static foam - don't remove them until needed. Fig 2. 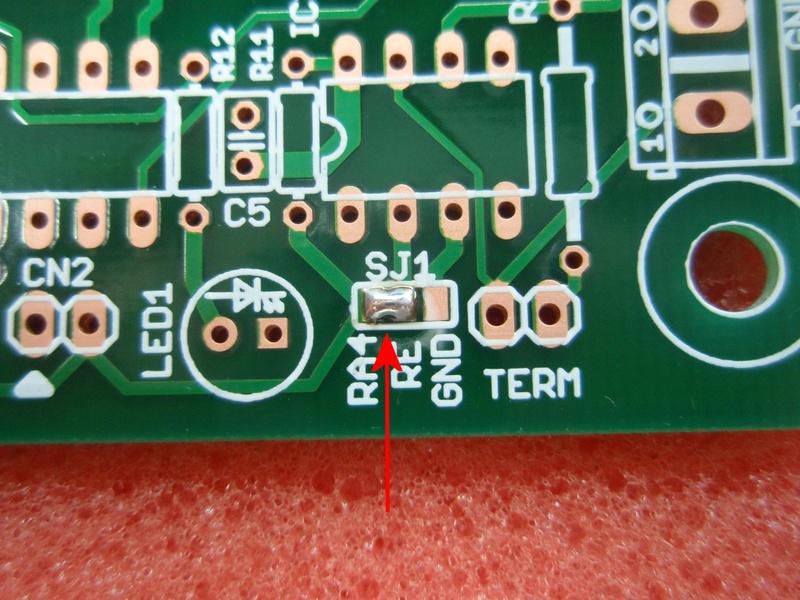 Start by placing a blob of solder across the RA4-RE pads of SJ1 solder jumper as shown. 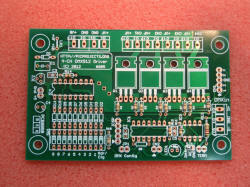 Do not allow solder between the RE and GND pads. Fig 3. Solder all the resistors in place. It doesn't matter which way round they go, the colour bands only indicate the resistance value. It is important that the correct value resistors are placed in the correct locations. 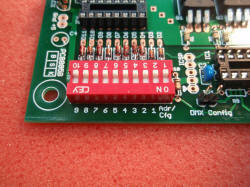 Resistor position R9 is not used with this project. Fig 4. Fit the diodes D1 to D11. These are all the same 1N4148 type. Each diode has a black band on one end of the body. Fit all the diodes so the black band on the diode corresponds to the white band on the component screen print overlay. Refer to the photo in Fig 4. Fig 5. Install the three 100nF capacitors to positions C2,C3 and C5. These are marked '104' on the body. MOSFETs are static sensitive devices. Avoid touching the pins and handle by the main body only. Install the MOSFETs one at a time. 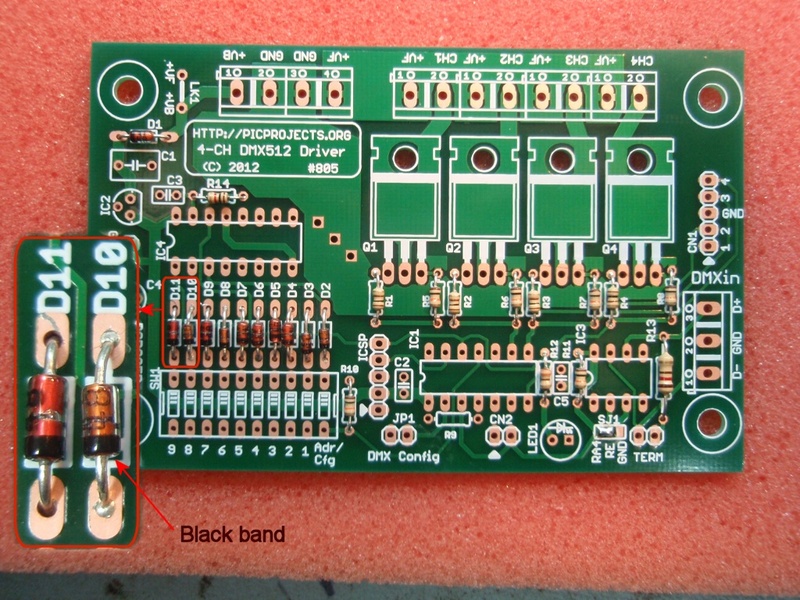 Place the pins through the PCB and then push down on the body of the MOSFET to bend it flat against the PCB. 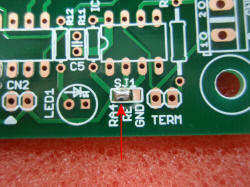 Use M3 x 6mm screw and M3 nut to fix the MOSFET to the PCB as shown. Repeat steps 1 to 3 for each MOSFET. 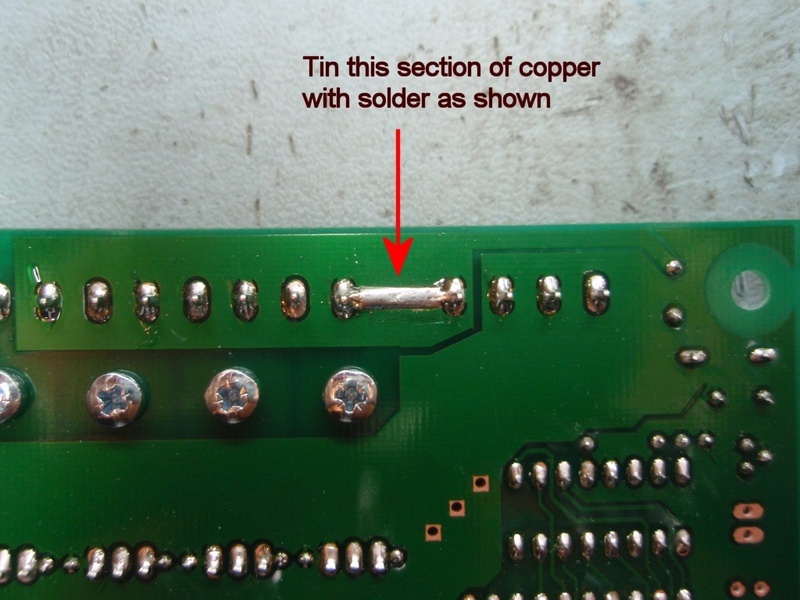 There is a large area of copper on the PCB required to carry up to 12 amps of current to the MOSFET, this will act as a heat sink when soldering the MOSFET pin connected to ground. 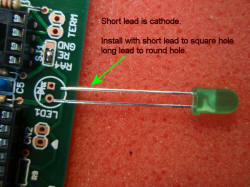 This can make it difficult to solder with a low power soldering iron. 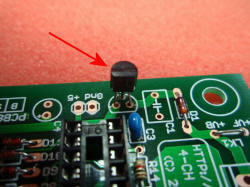 Check the solder joint is well made before proceeding. Fig 7. & 8. Showing installation of the MOSFETs. Fig 9. Fit the three IC sockets to the PCB. Make sure all the pins go through the holes in the PCB and check that none of the pins have bent under the socket before soldering. Each socket has an 'D' shaped indent at one end. This should align with the marking on the component screen print overlay. Fig 10. Fit the 78L05 voltage regulator to the PCB. 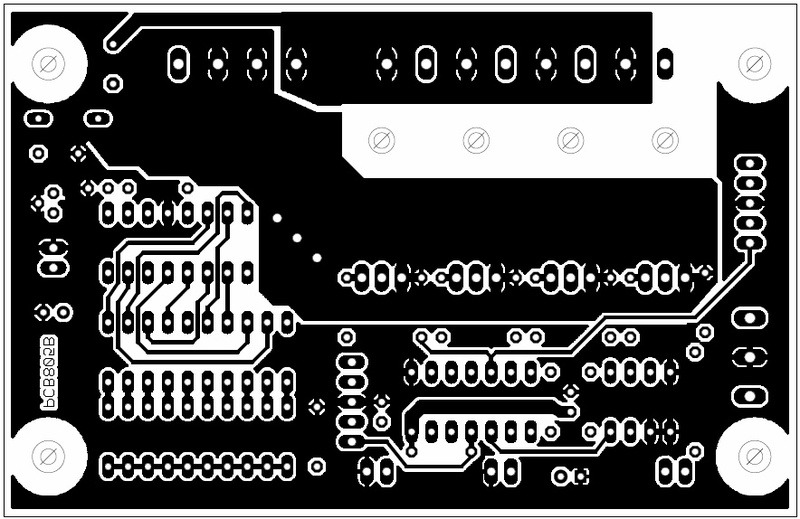 The pins may need realigning to fit the holes in the PCB. Take care to position it so the flat part of the body is aligned with the flat shown on the component screen print overlay. Fig 12. Fit LED1. One lead is shorter than the other. 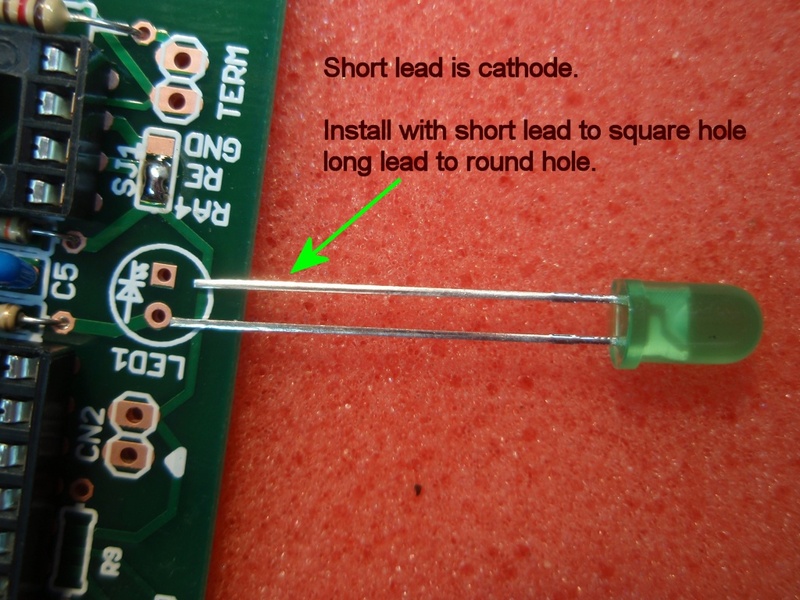 This marks the cathode terminal of the LED. Make sure to install with the short lead in the position shown in the photo. Fig 13. 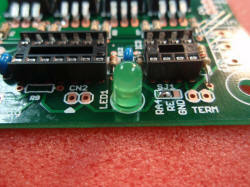 Showing LED1 installed on the PCB. Fig 14. 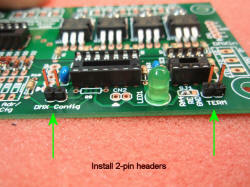 Solder the 2-pin header plugs to positions JP1(DMX config) and TERM as shown in the photo. Fig 15. 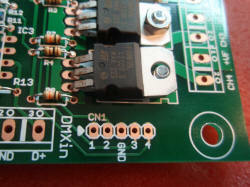 Solder the 10-way DIP switch to the PCB. 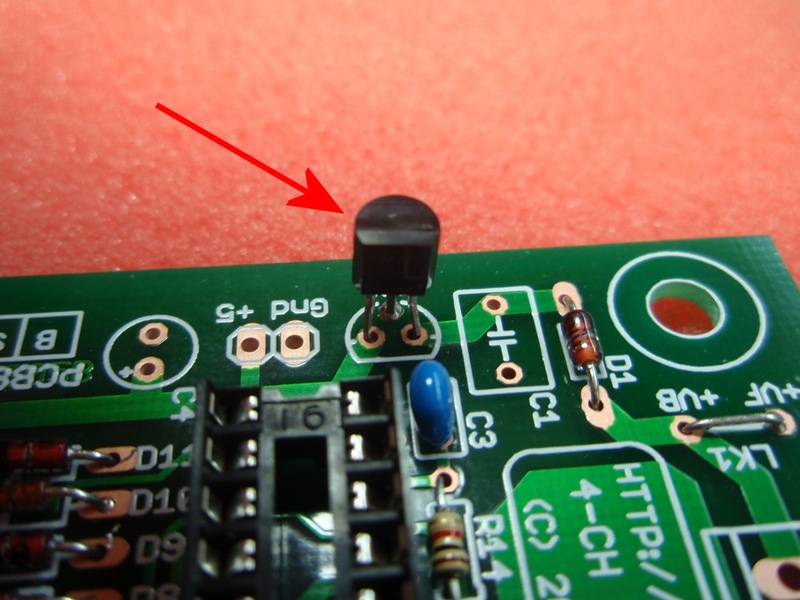 Make sure to fit it so the switch 'ON' position is nearest the edge of the PCB as shown in the photo. This will make it easier to follow the configuration examples in the documentation. Before soldering the switch into position check that none of the leads have bent under the switch instead of going through the PCB hole. This can happen and if you discover it after you start soldering the switch in place it's too late. Fig 16. Fit the 5mm screw terminal blocks to the PCB. The DMXin connector uses a 3-way terminal block. The other two connectors use end-stackable 2-way connectors to make up the 4-way and 8-way blocks. If the supplied connectors are not already stacked together you should do this before fitting to the PCB. Fig 17. 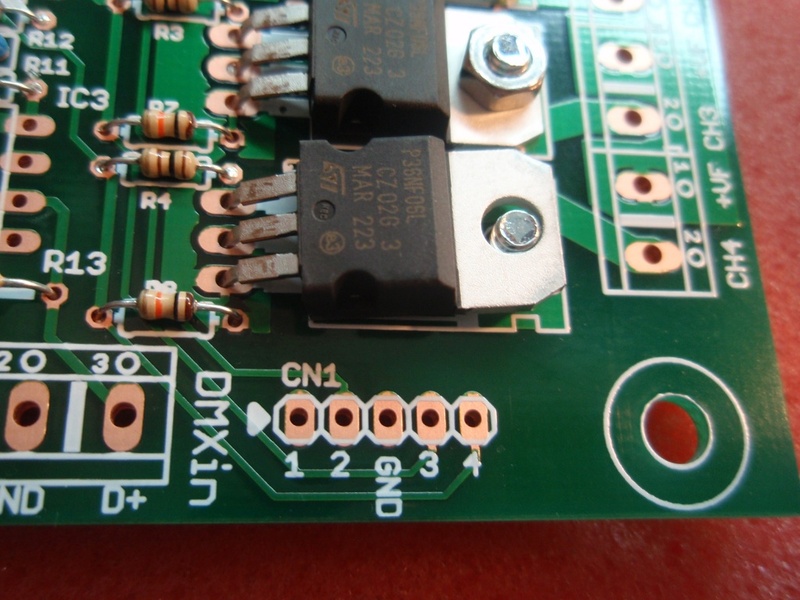 On the reverse side of the PCB there is a short length of exposed copper between the terminal blocks. 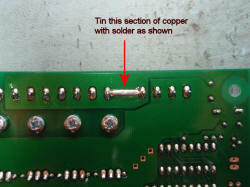 Tin this section with solder to increase the electrical current carrying capacity of the PCB track. At this stage the assembly of the board is complete. Give the board a good visual check to make sure all the solder joints are good, there are no solder splashes or bridges on any of the joints. Check components are in the correct location and orientation where applicable. Fig 18. 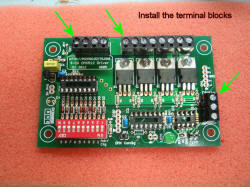 Before fitting the three IC's into the sockets check the 5 volt power supply to the board. 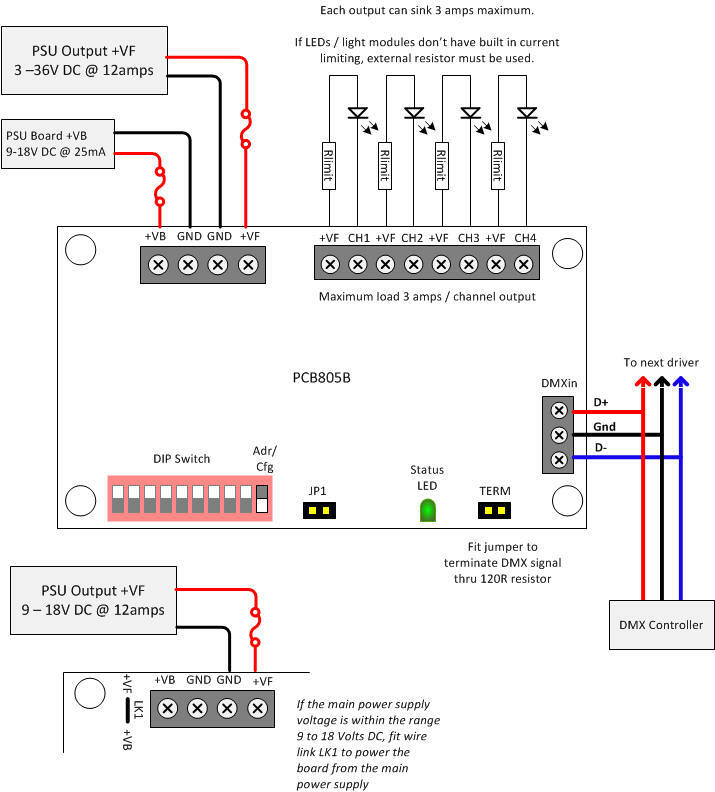 Connect a suitable DC power supply to +VB and GND connections of the power connector terminal block. 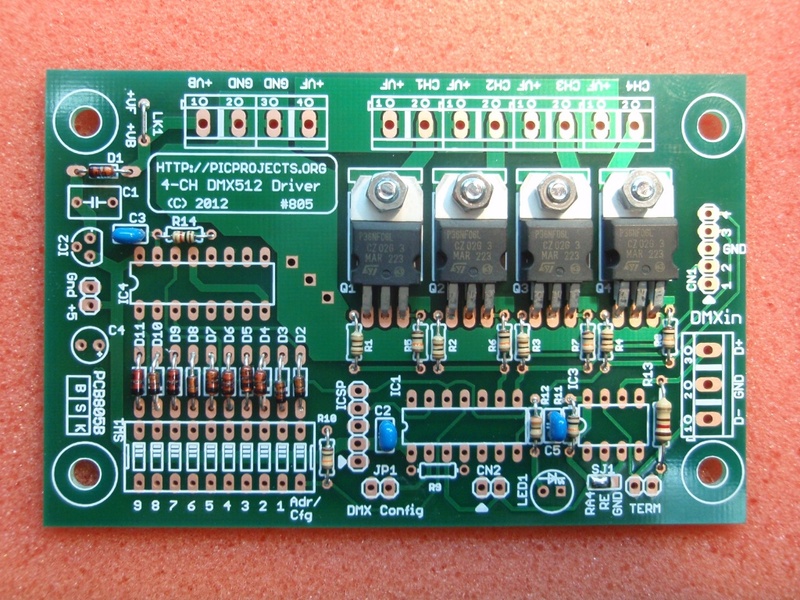 The power supply output voltage should be in the range of 9 to 18 volts. 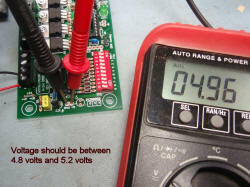 Measure the voltage at the 5 volt test point on the PCB as shown in the photo. The voltage measured here must be between 4.8 volts and 5.2 volts. If it is not within this range investigate and correct the fault before proceeding. Once the 5 volt power supply has been checked and is working correctly disconnect the power before proceeding. Fig 19. Make sure the board is not connected to the power supply! Fit each IC into the correct socket. Since each IC has a different number of pins there is only one socket that matches each device. Make sure that each IC is installed with the 'D' shaped indent in the body matching the indent in the socket. See photo Fig 19. Fig 20. Powering the board. 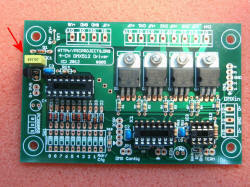 The control electronics on the board require a power supply input in the range 9 volts to 18 volts DC. This is made at the +VB and GND terminals of the 4-way terminal block. If the Channel Outputs are operating within the 9 volts to 18 volts range fitting the link wire to position LK1 will connect the +VF power input to the +VB board supply, eliminating the need for two power sources or extra wiring at the connector terminal. 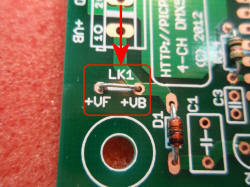 Only fit LK1 if the +VF power supply is within the 9-18 volt range. Below 9 volts the board will not operate correctly. 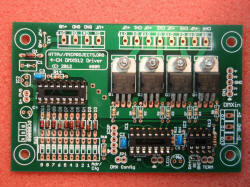 Above 18 volts components on the board may be damaged or destroyed. 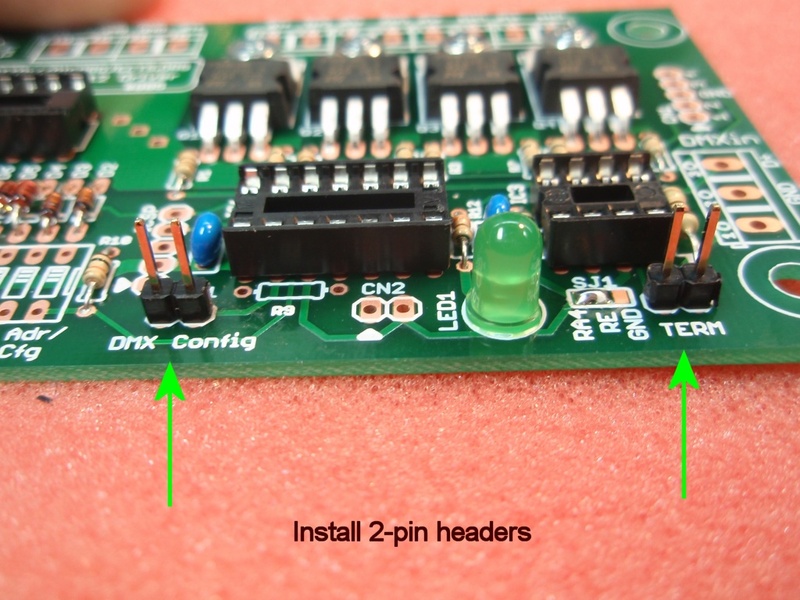 This is a general overview of the connections to the 4 Channel DMX512 Driver PCB805B. 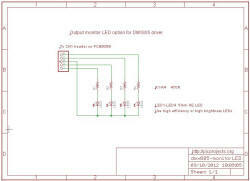 When connecting LED or LED modules to the controller consult the datasheet for the specific devices being used to ensure voltage and current limits are met. 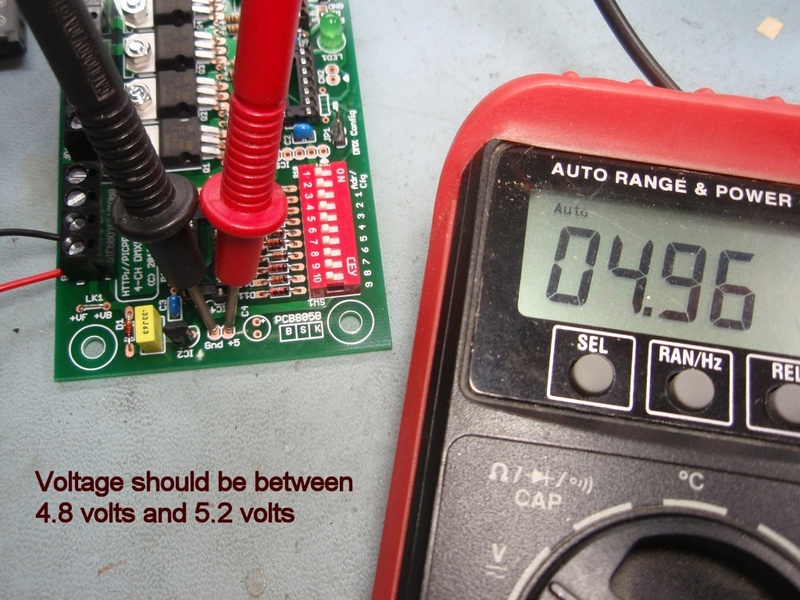 Do not operate the board at currents or voltages outside the ranges shown here. Ensure correct wire gauge is used for the current it will be carrying. +VF and +VB are the MOSFET and Board control electronics power inputs respectively. They are not electrically connected unless the link wire LK1 us fitted on the PCB. 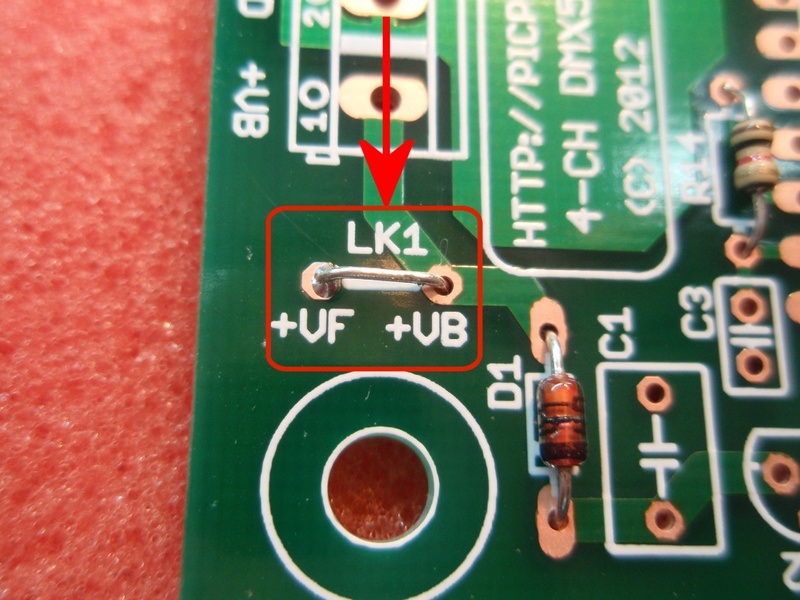 When fitted LK1 allows the board to derive its power from the +VF power input. This should only be fitted when the +VF input voltage is between 9 and 18 volts DC. Connection for DMX in-out using 3 pin XLR socket. There are also standards for 5-pin XLR and RJ45 connection. The DMX driver board has various user configurable options as summarised below. 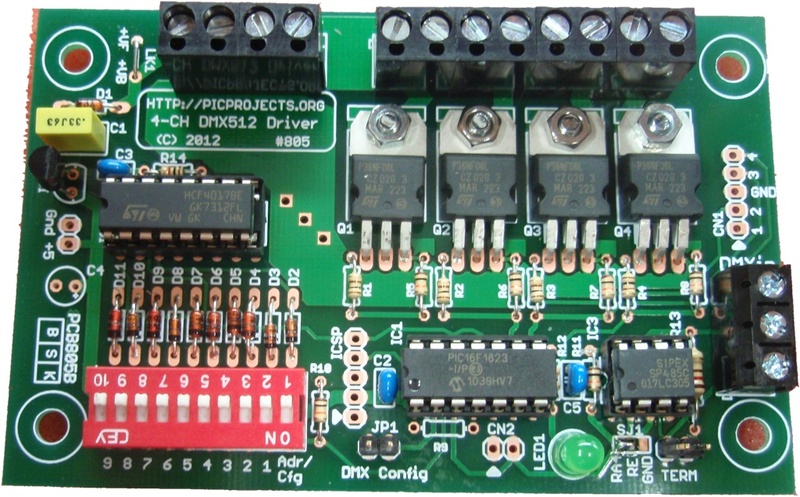 The outputs can be configured to operate in PWM mode or digital mode. Each channel can be individually configured to operate in either PWM or digital mode. Channel data values 1-254 - no change at output. When the driver stops receiving valid DMX data the outputs can be configured to either remain in their current state / maintain the PWM duty cycle, or turn off / set PWM duty cycle to 0%. The time from the last valid packet being received to entering the stopped state is approximately 1.5 seconds. As there are 4 outputs on the board the highest base address that can set is 509 since the fourth output channel then sees data at the highest DMX address of 512.
using a DMX controller to send the configuration as in-band channel data. Settings made through the DIP switch are saved to the microcontroller's internal EEPROM. Since the DIP switch is dual function it is used to set both address and configuration depending on the position of the Adr/Cfg switch. This means only one of the two parameters can be set at any time. The non-active parameters are therefore read from the internal EEPROM. i.e. If the DIP switch is set to configure the DMX base address, configuration modes are then set using the values saved to EEPROM. 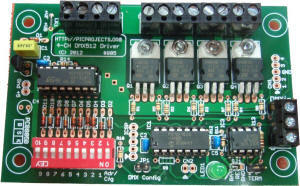 The firmware pre-programmed into the PIC microcontroller also supports In-band configuration over the DMX data channel. This allows the address and configuration mode settings to be set in custom designs that do not use the DIP Switch. In order to use this method of configuration the DMX controller must be capable of allowing the channel data values to be set precisely. Controllers that don't display the actual channel data value cannot be used since it's not possible to tell precisely what value has been set. Connect a physical jumper to JP1. Cycle power to the board. Channel data is read from the first valid DMX packet received and used to configure the driver as shown in the table below. Once the options have been programmed into the EEPROM the driver will blink its status LED in a repeating 2 blink pattern. Cycle the power to the driver to restart using the new settings. 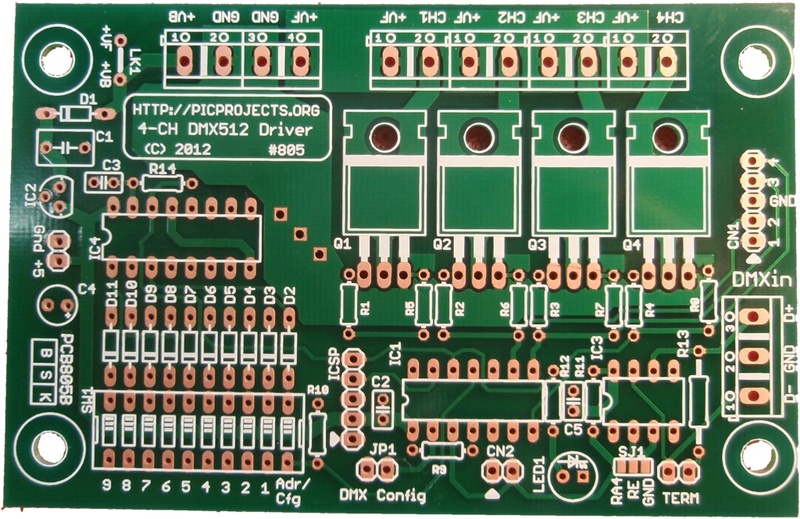 When JP1 is fitted, regardless of the currently configured DMX base address, the board will read the data from the first four channels of the DMX data frame. Channel 1 must contain the value 129 for the firmware to accept the frame. Channel 4 contains the configuration mode byte. After the firmware receives the complete frame the DMX address and configuration word are saved to the microcontrollers EEPROM. The firmware does not do any validation of the data at this time. When the data has been written to the EEPROM the status LED1 will blink twice and this repeats continually until JP1 jumper has been removed and the power cycled. When the board restarts with JP1 jumper removed, the firmware validates the DMX address. If it is not in the range 1 to 509 it will signal an error through the status LED1. If a DIP switch is fitted, the address or configuration mode set in-band will be overwritten by the switch setting at the next power-cycle after JP1 jumper has been removed. This can be prevented by setting all the DIP switches to the OFF position which is the same as having no DIP switch installed. 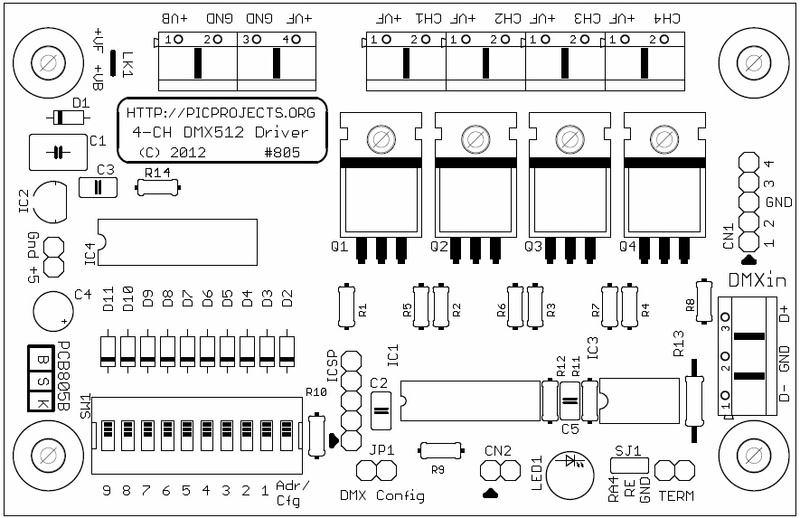 The binary bit positions in the channel data bytes correspond to the DIP switch position number shown in the diagram below. To configure the board with DMX in-band data set the bit positions to '1' or '0' in the channel data as you would the DIP switch to ON or OFF. 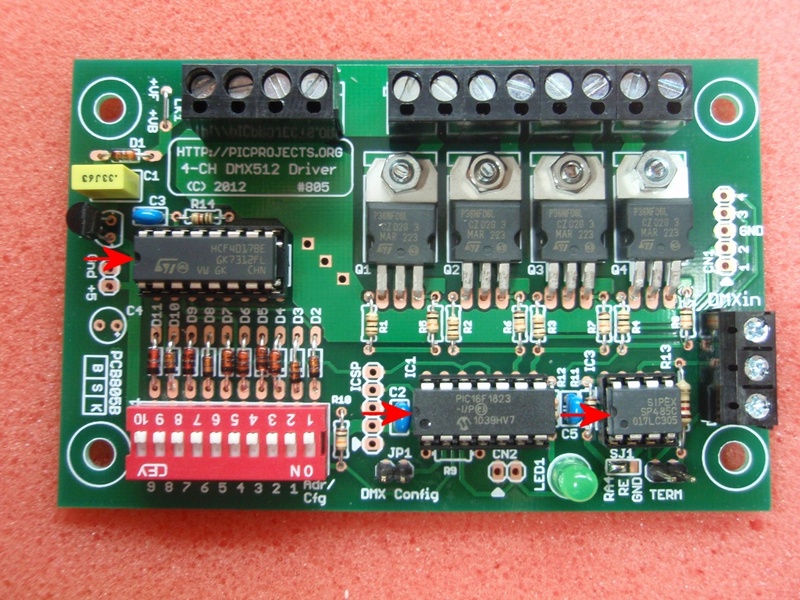 The driver board receives data over four consecutive channels starting at the base address configured on the board. The base address can be set to start at any address in the DMX packet, however it also needs to be set to an address compatible with the DMX controller. Some controllers expect the start address to be located at fixed offsets, eg. 1, 7, 13, 19, 25... Refer to your controllers documentation. Adr/Cfg switch should be set to OFF. The firmware then uses the rest of the DIP switch to set the DMX base address. 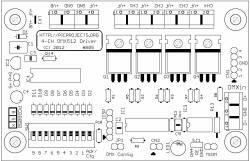 Switches 9 to 1 are used to set the binary value of the DMX Base Address used by the board. 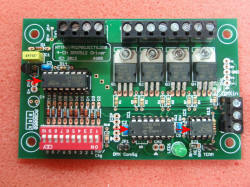 The DIP switch is only read when the board is powered-on. The address setting read from the switch is automatically saved to the microcontroller EEPROM. When no DIP switch is present, or the switch is set to Configuration Modes, the value previously saved to the EEPROM will be used. Example: To set the base address to 300, set switches 9,6,4 & 3 to the on position. Google will convert decimal to binary (see example below). Adr/Cfg switch should be set to ON. The firmware then uses the rest of the DIP switch to set the mode configuration for the driver board. Action on no DMX signal received. When no DMX signal is received the controller can either turn all outputs off, or continue to drive the outputs with the last PWM or digital output value for the channel before the DMX data signal was lost. Ganged Mode. In ganged mode all four outputs use the data from the Base DMX Address. Channel Mode. 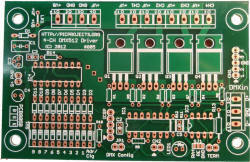 Each output can operate in either PWM or digital mode. The operating mode can be set for each channel individually. In digital mode the output is either on or off. When the DMX data value is 0 the output turns off. When the DMX data value is 255 the output turns on. DMX data between 1 and 254 is ignored and will not change the output. Self-Test. When self-test mode is enabled each output turns on at 0.5 second intervals until all outputs are on (100% PWM duty). Each output then turns off at 0.5 second intervals until all outputs are off (0% PWM duty). This repeats continuously until the self-test DIP switch is set to the OFF position and power is cycled to the board. During self-test, any data received on the DMX channel is ignored. The MOSFET channel power is applied to the +VF / GND connector terminals. Maximum current per channel is 3 amps giving maximum input power of 12 amps. The current rating of the power supply will depend on the devices being driven. Ensure you use a suitable power supply for your application. 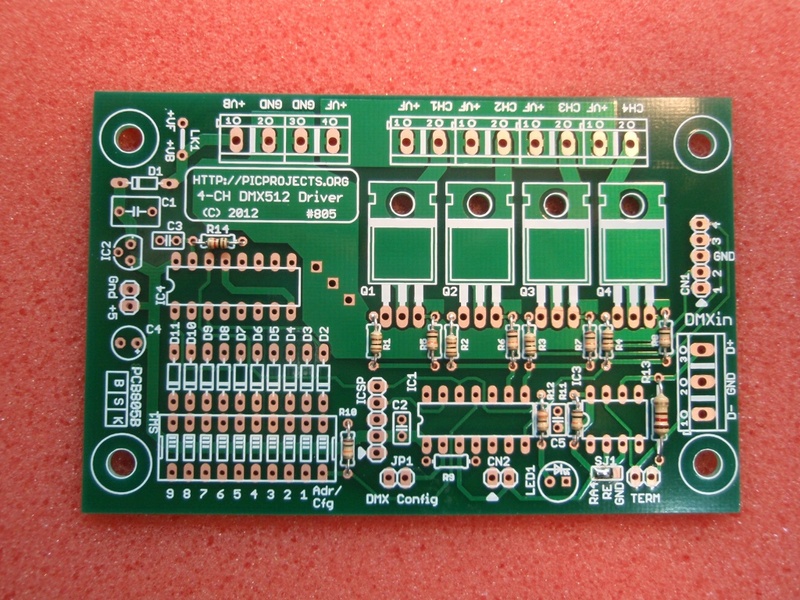 If the MOSFET channel power supply is within the range 9 to 18 volts, fitting the LK1 link wire on the PCB will allow the board to use the +VF power supply input eliminating the need for two power sources or extra wiring at the connector terminal. Low side switched outputs connected to the onboard MOSFETS. Channel 1 is controlled by data sent to the DMX base address of the board, channels 2,3 and 4 to the next 3 consecutive addresses. Do not exceed 3 amps per channel absolute maximum. There is no fault protection on the outputs so depending on your application you may want to use suitably rated in-line fuses. Connects to the DMX data cable. Since there are various DMX connector standards you'll need to wire this to the particular connector you are using e.g. XLR-3pin, XLR-5pin, RJ45 jack. TERMWhen the jumper is closed, the DMX signal is terminated into a 120 ohm resistor on the board. This should only be done on the last board. Also, if an external cable terminator is used, don't terminate on the board. 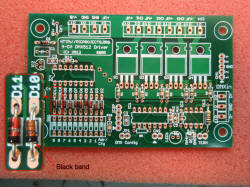 the edge of the board along with a GND connection. 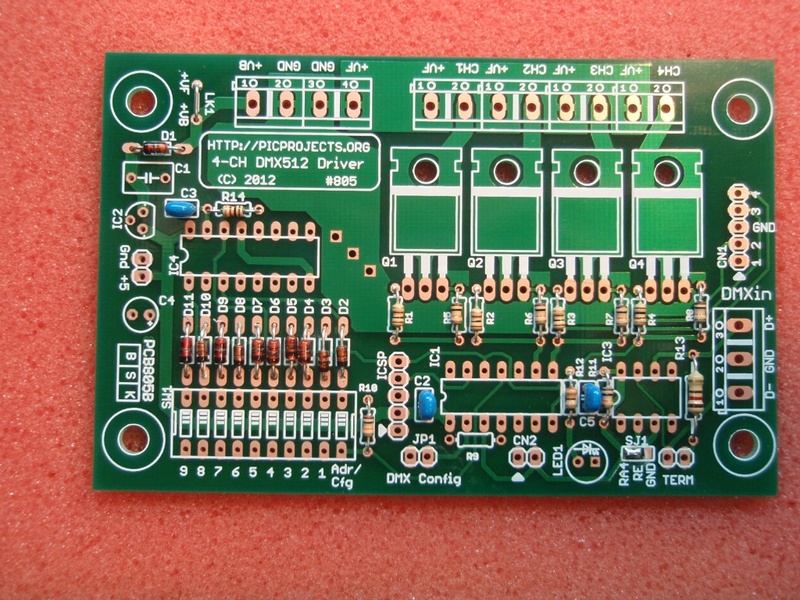 This makes it easy to interface the driver board to an alternative output device such as a relay module. 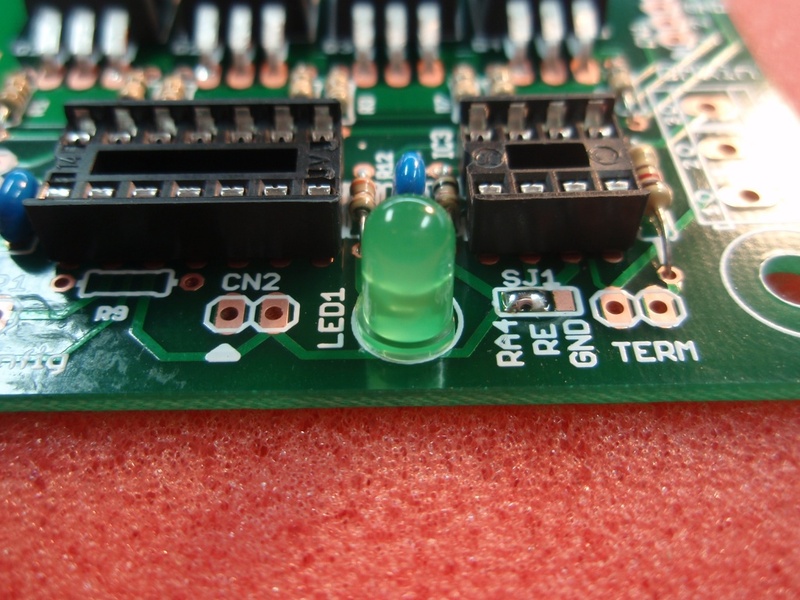 CN1 can also be used to connect four output monitor LEDs to the driver board. The schematic (left) shows how this can be done if it is required. Use high efficiency or high brightness LEDs with current limit resistors no lower in value than 470R to ensure the MOSFET gate drive voltage is not adversely affected. 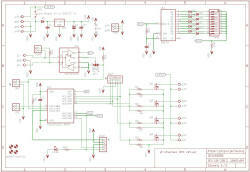 This provides a connection for In-circuit serial programming of the PIC. The status LED provides indication that DMX data is being received during normal operation and error and status codes if a problem is detected during start-up. 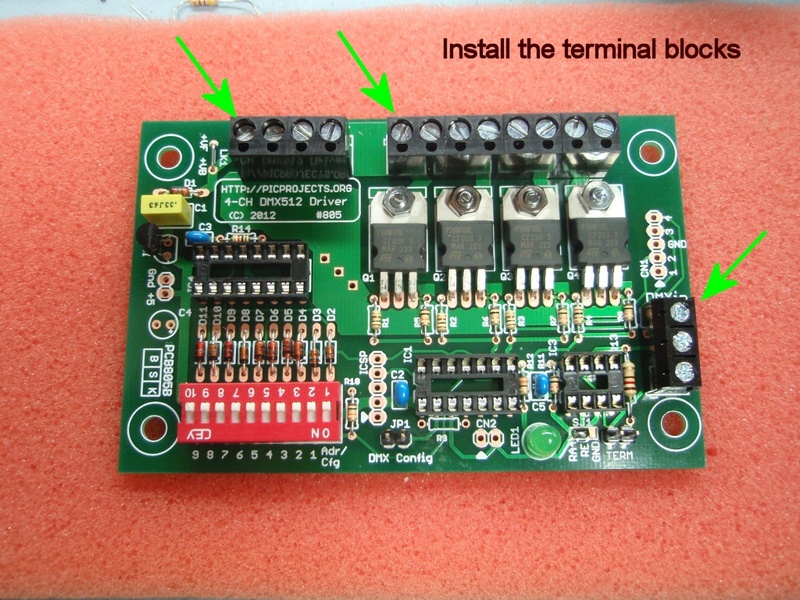 Note: Since the status LED shares the same PIC control line as a signal on the ICSP header when the the board is connected to a PIC programmer the status LED should be ignored until the programmer is disconnected. DMX D+/D- signal connection reversed. If an error is detected at power-on the status LED indicates the detected error condition or status by blinking a number of times followed by a pause; this repeats continuously. The cause must be corrected and the driver restarted to clear the condition and enter normal operation. 2 Completed a DMX in-band configuration. Status code 2 is not an error. Once the DMX configuration has completed, remove the mode jumper and cycle power to the board to use the new settings. Status codes 5 and 6. If these can't be cleared by cycling power to the board, then the PIC is faulty and should be replaced. The firmware for this project is not available to download. Velleman USB controller DMX interface (K8062) with the bundled software. This small application generates 8 frames of DMX data in channels 1 to 8. The data in channels 1 to 4 increments from 0 to 255 in a repeating pattern. Data in channels 5 to 8 is always zero. This code was written to allow testing of the DMX Driver with a DMX data stream where the Break, MAB, packet idle time, packet length, etc could all be configured. This was required since many commercial products don't generate DMX packets with minimum timing parameters and it was necessary to ensure the application code would work reliably under these conditions. 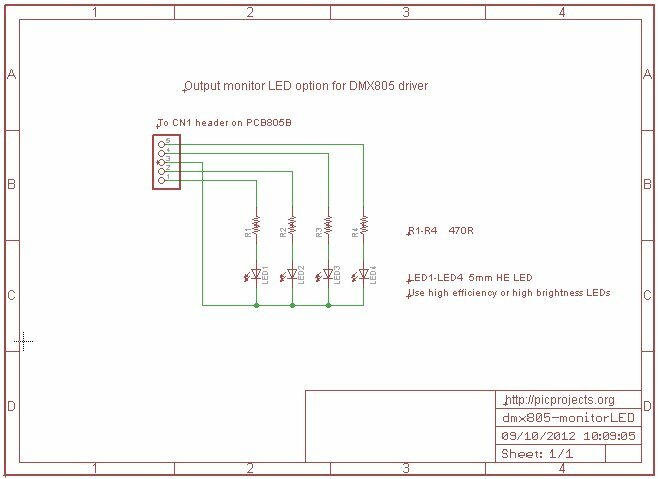 This code has been provided to allow testing of the DMX Driver described on this web page with a consistent DMX512 data packet stream. The DMX output from this code generates a Break of 94uS, MAB of 5.8uS and an idle time between packets of 5uS. Channel data is sent back-to-back with no delay.